This seems to be a time for long gestating sequels for superhero movies in the early 2000s though Glass has a few extra years on the Incredibles sequel. The biggest difference is that while Glass took place more or less in real time that many years after the events of Unbreakable, Incredibles 2 literally starts almost immediately after the events of the first Incredibles with the aftermath of the Underminer. Where the first film was about how superheroes became illegal and while Bob and Helen Parr tried to build a normal life together, Bob was unsatisfied and felt the need to superhero again. This time around, heroing is still illegal, but it’s Helen who gets the opportunity to show off her superheroism. The biggest difference is that while Bob was doing this as a sort of midlife crisis and the thrill of it, Helen’s motivations are more about the future of her family and the benefit of superheroes everywhere. The family is still the focus of the majority of the film only this time the dynamic has changed. Bob has moved past his mid-life crisis and during this movie has to deal with being the stay-at-home dad while Helen is the one not only doing all the work, but getting all the press for it. There is a bit of misplaced anger and jealousy but it’s quickly brushed under the rug for the rest of the plot which is a little disappointing that it never really gets properly dealt with. But it’s also better as it presents a better feminist viewpoint with Helen being successful and very capable in her role. Not only that, but it doesn’t give short shrift to Bob as the stay-at-home dad. He struggles, but he’s not comically incapable. He’s able to help Dash with his homework, he tries to help Violet with her boy troubles, and he does his best with Jack-Jack and his newly discovered super powers. One aspect of this film that was a little bit difficult to fully process was the time period that it was set in. The design and technology felt like it was supposed to be set in the 70’s. The problem was that the characters and situations felt much more modern in their sensibilities. Bob’s problems with Dash’s math felt like it was about common core, something that has become widespread much more recently. Of course, another way to look at it is that rather than feeling out of place, the modern sensibilities and retro designs help give the movie a more timeless feel to it, especially with the addition of the alternate superhero timeline. This movie also introduces a new crop of up and coming superheroes and they are exactly the mixed bag that you might expect them to be. Along with the potentially high tier heroes like the apparently super strong Brick, telekinetic Krush, and electrically charged Helectrix, there’s also the mid tier Owl guy and unsure of herself Voyd, and to round things out there’s the potential joke Reflux. Aside from Voyd who gets the most screen time and has the most character, the rest are all one note caricatures that are basically defined by their powers. Even though the film is named after Mr. Incredible, there is an overall feminist throughline to the film. Helen is the one who becomes the face of the returning superheroes, but there’s also Voyd who is the main voice of the hopeful new batch of superheroes. And on the other side of things, there’s Evelyn Deavor who ends up being the villain of the movie as the brains behind the Screenslaver with her plan to enslave the heroes and turn their good press back around to bad press to keep them illegal forever. Even with the family, whenever Dash, Violet, and Jack-Jack have to rescue their parents, Violet steps up and becomes the responsible one to help pull them through. 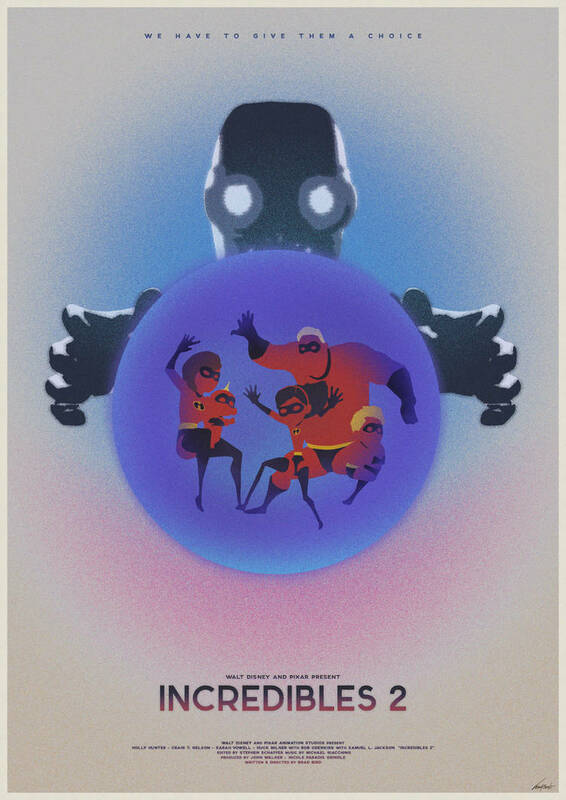 The action is what we’ve come to expect from an Incredibles movie, it knows how to use the characters powers in interesting ways and we get to see a few more interesting choices for Violet and Elastigirl, especially during her chase with the Elastibike. Voyd also has some interesting choices for her powers and her fight with Violet is fast-paced with a lot of different choices. Jack-Jack also gets a slightly expanded powerset and he has a hilarious fight with a raccoon. There’s a great mix of family drama, action, and humor throughout with a little bit of mystery as Helen tries to figure out what’s going on with the Screenslaver. There are some issues here and there, but they are mostly nitpicks and it’s fantastic to see the family back again, especially as it feels like they picked up right where they left off. I’m not sure where they could go from here, but I’d be happy if they were able to figure it out. Until next time, this has been Bubbawheat for Flights, Tights, and Movie Nights. Posted on February 4, 2019, in 10's movies and tagged animation, film, movies, review, sequel, Superhero. Bookmark the permalink. 3 Comments. I have still not managed to watch this in its entirety as I am beholden to my Incredibles obsessed toddler’s attention span… which is short. I’m glad I’m past those days. There was a span of about three years before we started watching movies in theaters again. Now she’s 12. We do manage to watch kids movies in theatre and he loves it but at home it’s too easy to get distracted.